Leek and Potato Gratin is the ultimate comfort food with creamy and delicious flavor. 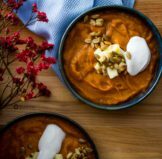 This side dish recipe will pair well with any meat, chicken or fish, being a great addition to your table during Thanksgiving, Christmas or any special dinner throughout the year. Thinly sliced potatoes are gently cooked for 5 minutes in milk, bay leaves, salt and crushed garlic. Then bake with a layer of sautéed leeks, Gruyere cheese, Parmesan cheese, white pepper & Organic Honey Dijon Mustard. Finally broil for a crispy, cheesy top. Hello my friends. 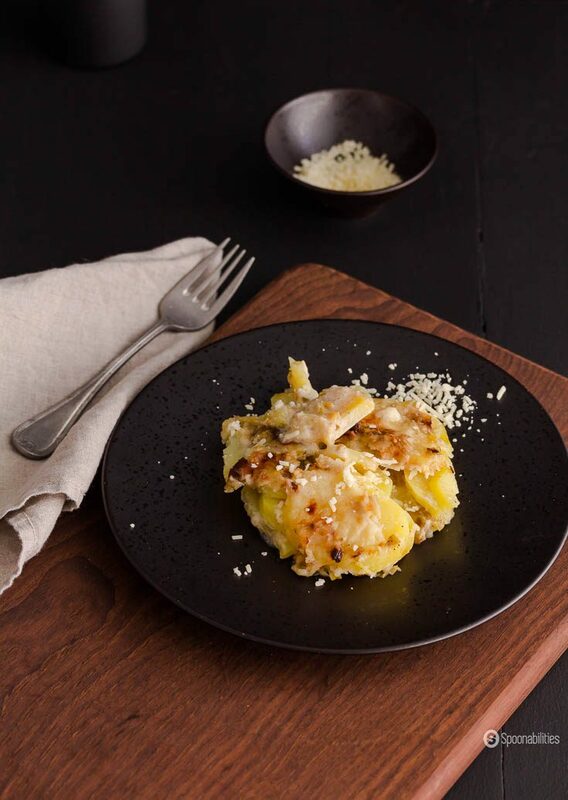 Leek and Potato Gratin is my favorite recipe from my Fall-Winter side dish series. Geoffrey will say of course that anything with potatoes would be my favorite meal. And, it’s very true. I love potatoes and I can eat them every day. My favorite way to eat potatoes is both mashed potatoes and potato salad. My favorite meal combination is spaghetti, rice, and mashed potatoes topped with a fried egg! Everyone tells me that I’m crazy. This plate is a carbs overload and no protein, but it’s SO GOOD! Do you have a favorite combination like this one? Let me know in the comment section. You know I always find something interesting when I’m writing the blog post every week and this time is no exception. I got a bit confused trying to find the best name for this recipe because when I searched “potato gratin,” I got a lot of results for “potato scallop” and the recipes were almost identical with minor differences. So of course that started my research to find out what the difference was between scallop potato and potato gratin. What’s the difference between scallop potato and potato gratin? 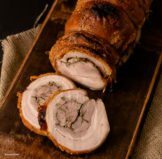 First, both dishes are made with thinly sliced potatoes and baked in cream or milk sauce and topped with breadcrumbs and broiled until brown. Au gratin is a French culinary technique, which means an ingredient covered in breadcrumbs or cheese and broiled until the crust is browned. 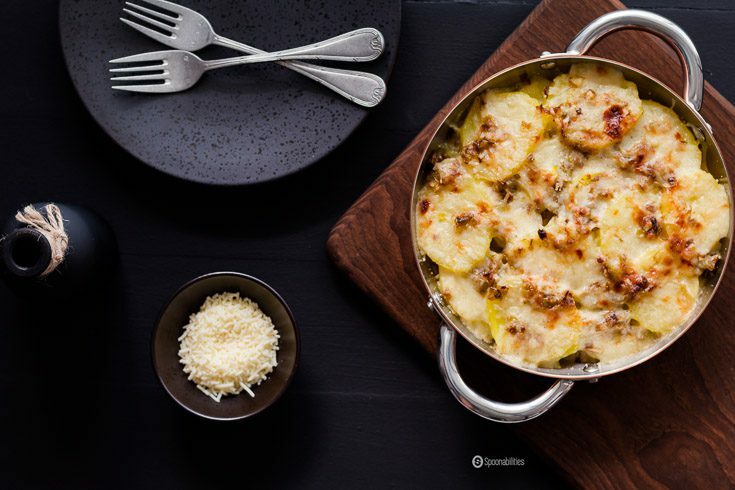 Au gratin always includes cheese, and the gratin technique can be used with other vegetables. Scallop is the same French technique but doesn’t involve grated cheese on the top. So the main difference between the scalloped potato and potato gratin is the cheese! To make scallop or gratin potato it is very important to pick a potato that will hold its shape when it’s baking in the creamy liquid. I recommend using a starchy potato, and the starch will help to thicken the cream. Some of the best potatoes for potato gratin are russet potatoes and Yukon Golds. The russets will give you a more creamy texture, and the Yukon Golds will hold their shape beautifully. I chose Yukon Golds for this Leek and Potato Gratin. To cut the potatoes thin and evenly, I highly recommend getting a mandolin. 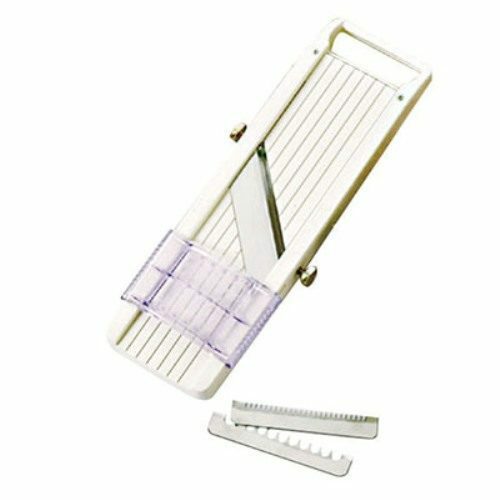 I purchased one from Paderno World Cuisine kitchen slicer, with 4 blades. Always use the protective finger guard. I personally find it a bit difficult to cut big pieces with the protective guard. 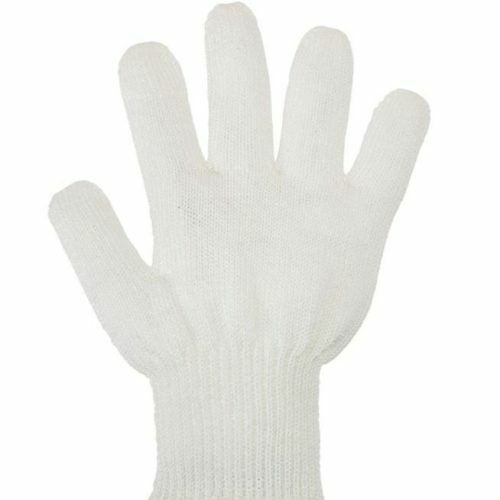 So, I purchased a cut resistant glove which works perfectly for me. Again, DO use a protective finger guard or glove. You don’t want to get your fingers in the middle of that blade because it won’t be pretty. The way I did this leek and potato gratin recipe is very different than previous recipes I have made before. Usually, I boil the whole potato and then cut them into slices. This time I cut the potatoes with the mandolin and cooked them in a medium saucepan with milk, garlic, and bay leaves. Bring them to a quick boil and then reduce the heat to a simmer for only about 5 minutes because they will finish cooking in the oven. Make sure to reserve one cup of milk and discard the bay leaves; take the garlic and mash it and put it back into the milk. This milk mixture will be added on top of the completely setup dish before putting it in the oven. In a separate cup of milk, you will add some mustard, nutmeg and white pepper. 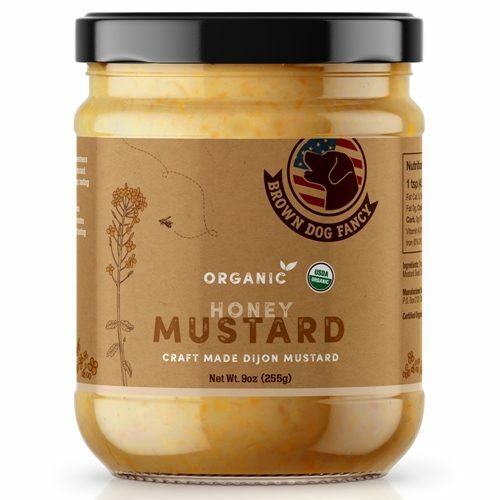 I use Organic Honey Dijon Mustard (which you can buy in our online store for $6.99). Then stir well until the mustard dissolves. 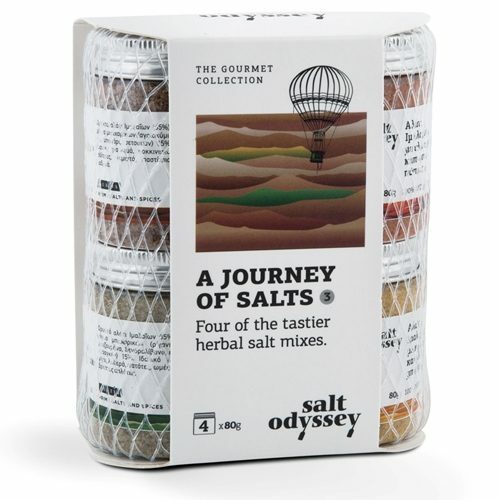 Meanwhile in a frying pan, add four TableSpoons of olive oil, add the leeks, sea salt with oregano and other spices by Salt Odyssey (also available in our online store). Sauté for about 8 minutes or until the leeks become tender. Keep the leek mixture in a small bowl until you are ready to assemble the dish. In an oiled (I use Eleon EVOO) 7-1/2” baking dish or round omelet pan, place the first layer of potatoes, add ½ of the sautéed leeks and spread evenly, then ¼ cup gruyere cheese. Repeat with another layer or potatoes, leeks and cheese. Then drizzle the ½ cup of reserved milk mixture, and top everything with the parmesan cheese. Cover with aluminum foil and bake for 25 minutes at 375 degrees Fahrenheit, and then broil uncovered for 5 minutes until the top gets golden. If you haven’t noticed… I didn’t use butter at all for this recipe. I almost forgot to tell you which of the half jars from our pantry I used for this recipe. I used some leftover ingredients from the previous two side dish recipes I made recently. One of them is the Eleon Olive Oil that I opened for the Pecan Honey Mustard Dressing; Sea Salt Odyssey from the Shiitake Cremini White Mushroom Stuffing Recipe; and Organic Honey Dijon Mustard that I used for the Yellow Pea Shoot Salad Recipe with Mustard Vinaigrette, and the Apricot Chicken recipe. 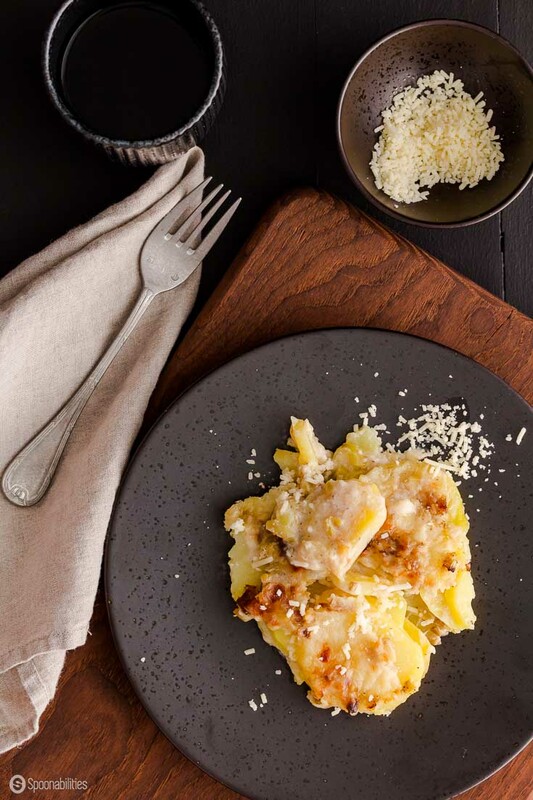 This Leek and Potato Gratin Recipe is tasty, tender, cheesy, and amazingly delicious. I will definitely make it again either for Christmas or New Year’s Eve. Maybe both. Have a happy and thankful week. Leek and Potato Gratin is the perfect side dish to complement any dinner for special occasions, and holidays like Thanksgiving and Christmas. This recipe is simple with a rich, creamy taste from the beautiful combination of gruyere & parmesan cheese, milk, and other spices, and the deliciously sweet flavor of Organic Honey Dijon Mustard. Combine milk, potatoes, bay leaf, 1/4 teaSpoon salt, and garlic in a large saucepan; bring to a boil. Reduce heat and simmer 5 minutes or until potatoes are almost tender. Drain in a colander over a bowl, reserving 1/2 cup milk mixture. In the milk mixture, add nutmeg and simmer for a few minutes. Before removing from the stove add mustard, stir well. Set aside. 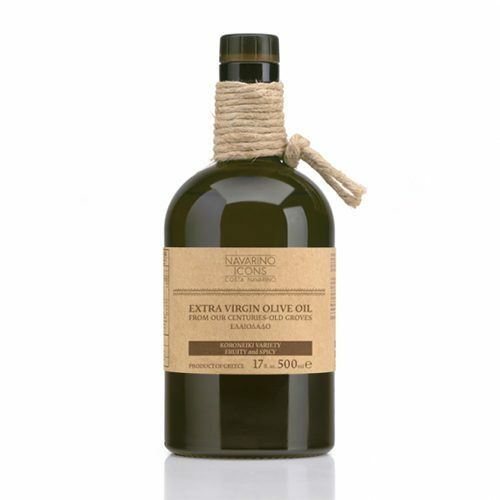 In a 12-inch nonstick frying pan set to medium, heat 4 TableSpoons of the olive oil. Add the leeks, a 1/4 teaSpoon of the pepper and a 1/4 teaSpoon of the Sea Salt with herbs. Stir to coat the leeks with the oil. Stir occasionally until the leeks are tender - about 4-8 minutes. Remove pan from heat; place leek mixture in a bowl. 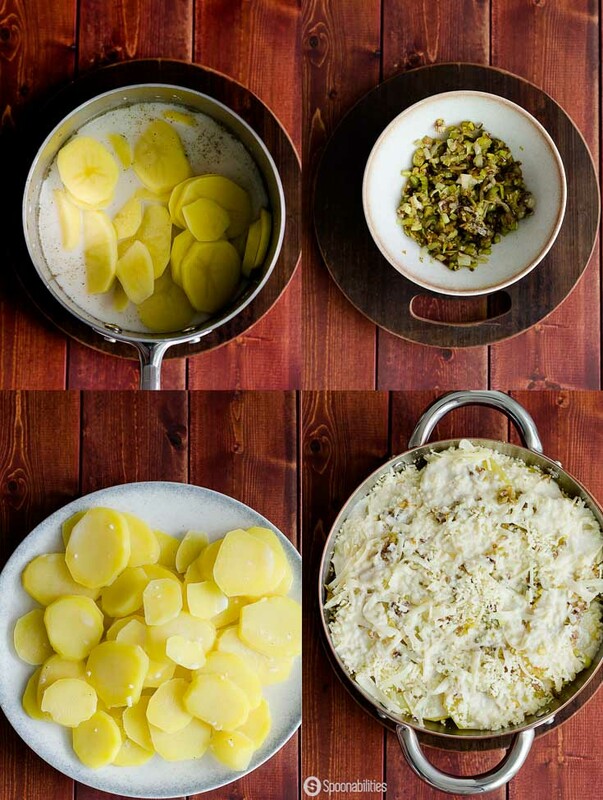 Arrange half of potato slices in a single layer on the bottom of a gratin dish; top evenly with half of leek mixture. Sprinkle with 1/2 teaSpoon Sea Salt and 1/4 cup of Gruyère cheese. Repeat layers with remaining half of potatoes, remaining half of leek mixture, remaining 1/2 teaSpoon salt, and remaining 1/4 cup Gruyère. Drizzle with reserved 1/2 cup milk mixture; sprinkle with Parmesan. Cover pan with foil; bake at 375°F for 25 minutes. Remove foil from pan, not removing pan from oven. Turn on broiler and broil for 5 minutes or until bubbly and golden brown. Remove pan from oven, sprinkle with pepper; cool. Cut into wedges and serve. How delicious! And great that you can buy the mustard directly from your website. Genius! Thank you so much Victoria! 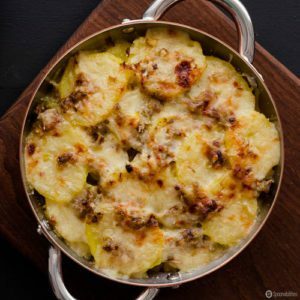 This leek and potato gratin is super delicious! Love the idea of adding leeks to the potatoes! Haven’t tried that! Amy, I love to use leeks on everything. I have another fantastic recipe coming soon with leeks in soup. This looks so good! I love an easy, healthy, and delicious meal. I have to try this! Yummy! Hi Luci, taste really delicious and I didn’t use butter at all. 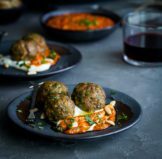 This dish sounds like one of those perfect comfort foods, great for a supper at the end of a busy day. I love leeks with potato, they go so well together; and then the perfect partner is cheese. Delicious. This looks delicious! The leeks must add amazing flavor. I also enjoyed learning the difference between au gratin and scalloped! So glad you like this recipe Denisse, and that you mentioned learning the difference between au gratin and scalloped. Carlos is trying to include something that he learns as he makes each new recipe. We are very happy that people are actually reading LOL. This looks delicious. I never knew the difference between potatoe scallop and potato gratin thanks for that info. Thanks Chichi. Hope you get to try the recipe. Thanks for mentioning the difference between scallop and gratin. We started including things we learn as the recipes are made. Love this recipe, it is very similar to the French Gratin Dauphinois. I make it very often but I don’t boil the potatoes first. I put the potatoes layered with onions and covered with milk in the microwave for 20 minutes. Then grill it with the cheese just before serving. I like your selection of flavours and I will try them next time. WOW, your version sounds wonderful. We’ll have to try it next time. Love the idea of grilling them with the cheese. Thanks!!! I adore potatoes as well. They’re so versatile and delicious in so many ways! 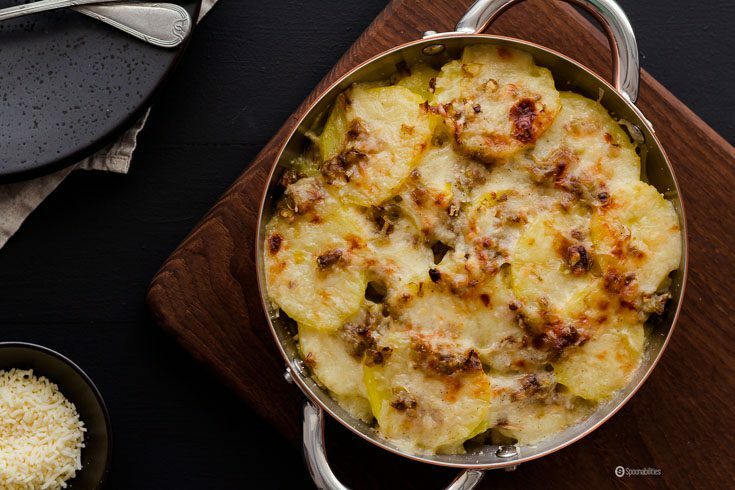 This gratin looks like a fantastic side dish, and I bet the leeks add such a nice flavor. Very true Marlynn, the leeks add a very nice flavor to the dish. Thanks for coming by today. What is your favorite potato dish?? I never thought you could make the combo of potatoes, leeks and cheese any better. But that mustard? Ah-maz-zing! It must add a gorgeous flavour. Yes Nicola you are correct. The Organic Honey Dijon Mustard gives it a wonderful extra flavor on top of the potatoes, leeks and cheese. Thanks for mentioning it. Enjoy! This looks too good to have such few calories! I have to try this one ASAP! Hi Lucy, This dish is a winner, and you should give it a try soon. I have never made potato gratin before, and we need to change that because this looks delicious! I love stuff like this, so simple and so very tasty, French peasant food at it’s very best! Hi Brian, Thank you for your comment. 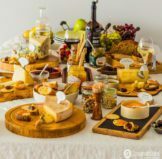 Yes, French food is one of the best!! 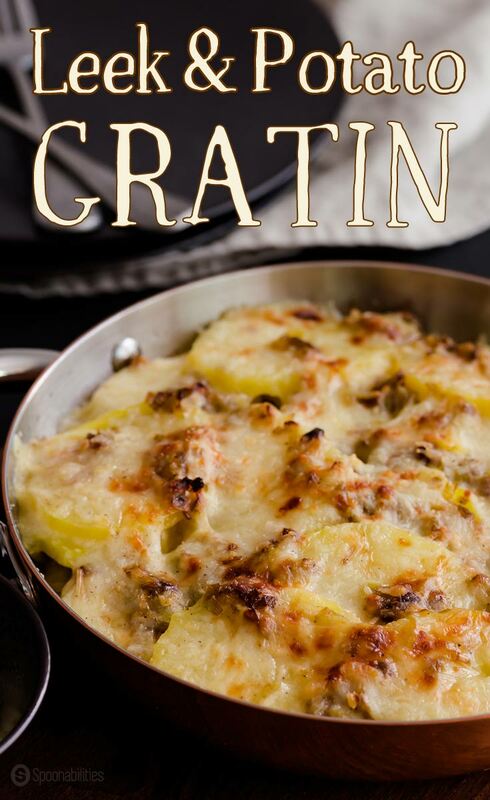 This gratin looks so comforting and delicious! Perfect on cold winter days! Hi Natalie, Definitely this is a comforting dish.